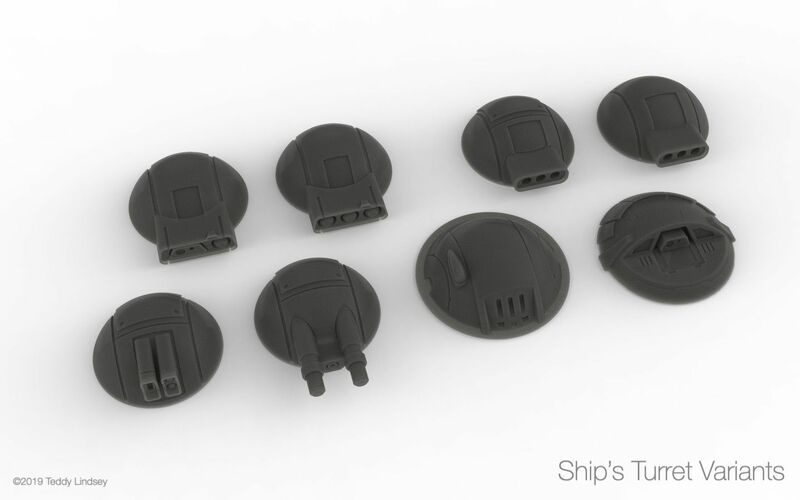 I’ve been experimenting with modeling and printing a number of turret designs gleaned from various Traveller illustrations over the years as optional components for my starship models. It’s common to see Traveller illustrations that depict ship’s turrets as hemispheres with an oblong weapon battery with three circular weapon ports. I refer to this as the “classic turret”. The classic turret is generic enough that you don’t have to specify what type of weapon is in each port. Another common design is the double or triple barreled “laser cannon”. Whether an elongated barrel for a laser weapon is necessary is questionable, but it’s instantly recognizable as a weapon turret. In the Traveller universe, beam lasers are more effective at achieving hits whereas pulse lasers are more effective at dealing damage. I’m designing under the assumption that beam lasers emit a sustained, continuous beam, where having a larger barrel might make sense at lower tech levels for cooling purposes or some other hand waving explanation. Conversely, pulse lasers probably don’t require a big barrel, so they can be contained within the main volume of the turret itself. Below is a rendering of some of the turrets I’m currently working on. 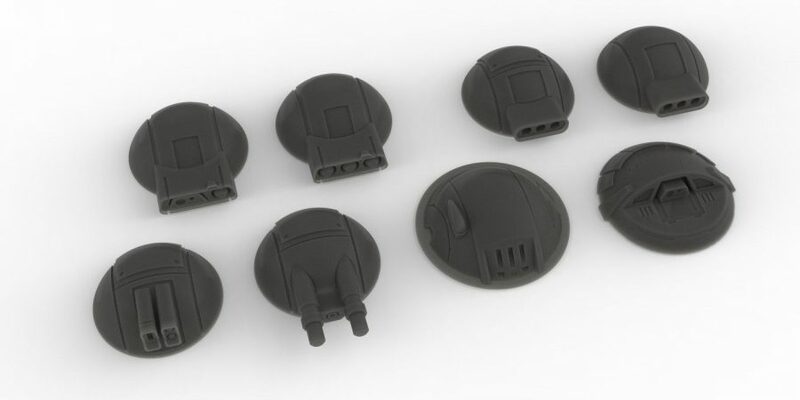 Back row: dual laser/missile, triple missile, classic triple turret #1, classic triple turret #2. Front row: dual laser/missile, dual laser & sandcaster, triple laser, single laser. Well, when you look at the Navy’s laser turret system, there is a certain amount of ‘barrel’ length, not quite unlike what you have in your model. With Traveller, tech level variance and the sheer diversity of the Imperium can explain away pretty much any differences that arise. That “dual laser cannon” might be a Tech Level 9-10 beam laser, or maybe it’s a Solomani model built to evoke an image of old Earth fighting vehicles!